Gordon builds some of the finest road racing vehicles. 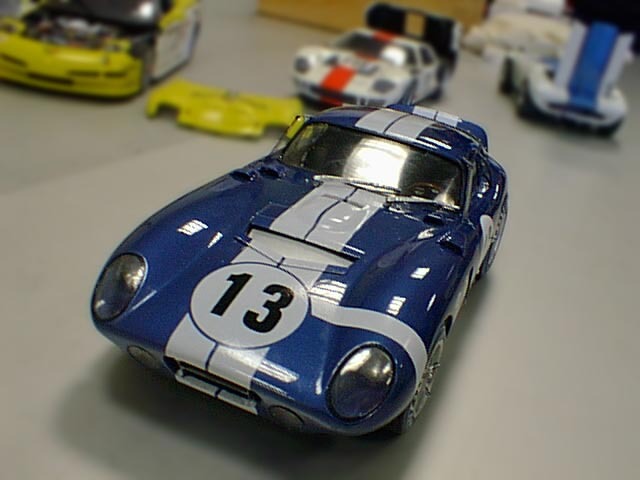 With this cobra Daytona he's outdone hmself. Working with the exceptional, nearly 190-piece kit from Historic Racing Miniatures (HRM), Gordon pushed his detailing and painting skills to new heights. He said he built this stunning LeMans winner to win at the TAMS show on October 25th and for Historic Racing Miniatures to take to model car shows and swapmeets as a demonstrator for thier kit. Although HRM includes Fred Cady decals with their kit, Gordon had to add the stripe that crosses the driver's side front fender to replicate the Number 13 car. He used the stripe from an old Gunze kit's decal sheet to make a template, then transferred the template to a white decal sheet so he could cut the decal perfectly.